Get Caught Up On CLASH & Watch The Seize The Day XI Postshow Now! Get caught up on all the happenings in CLASH Wrestling as we head into CLASH To The Future on March 24th! Matt Bishop runs down the events of SEIZE THE DAY XI & much much more! 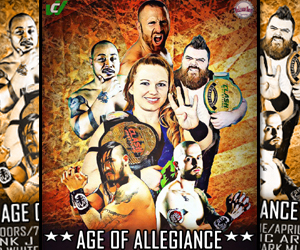 CLASH Returns For Age Of Allegiance 2016 on April 23rd! CLASH Wrestling will return with Age Of Allegiance presented in conjunction with Big League Brews this Saturday night April 23rd at the Taylor Town Trade Center. Bell time is 8:00 PM with can’t miss action. This all ages event will play host to a number of blockbuster matches featuring the competitors of CLASH Wrestling, including new CLASH Champion Elk, CLASH Tag Team Champions The Midnight Society & Detroit’s Own Allysin Kay! Doors open @ 7:30 PM and tickets are just $15! Detroit’s Own Allysin Kay In Action! Divided We Fall Is November 21st! Get The Full Scoop On The Show Here! On November 21st 2015, CLASH Wrestling and Big League Brews will present Divided We Fall at the Taylor Town Trade Center located at 22525 Ecorse Rd in Taylor, MI 48180. The annual Divided We Fall event has become notorious for its elimination style matches. This year a new twist will be brought to the great fans of CLASH Wrestling. Never before has an event like this taken place in CLASH. For the first time ever, Divided We Fall will feature 16 of CLASH’s competitors in 4 traditional style tag team matches. These matches will be chosen at random, which means NO ONE will not only not know who their partner is, nor who their opponents will be. The action doesn’t stop there. The winners of those 4 matches will be paired off into two teams. The winners will get to form their own alliances, and do not need to do that with the partner from their previous match. These two teams will square off in a tradition Divided We Fall Elimination Match as the main event. Eliminations can of course occur via pin-fall, submission, disqualification, or count-out. The bragging rights at Divided We Fall have never been higher. This is truly a unique must see CLASH Wrestling event, and it’s the annual close out show for the year. Seize The Day 9 (AKA The 8th Anniversary Show) is on January 30th 2016 and Divided We Fall is the last opportunity for a competitor to gain a mental edge of their nemesis. This will also be the last show before Gavin Quinn and Junthai put their careers on the line against one another at Seize The Day. This is a MUST SEE Event if there ever was one.